Sir John Hegarty visited IPC Media last week, and talked to us all about ideas, creativity and storytelling. As you might expect, he was wonderfully entertaining, full of wisdom and insight, and accompanied by a stunning showreel. Included in that was this TV ad for the Guardian, which has just won a gold medal for his agency BBH at the Cannes Lions Festival of Creativity. It’s a brilliant illustration of citizen journalism, but how does it compare to other media brand ads? There are lots of ways ad agencies can give media brands a little extra muscle. From billboards, press ads, and TV campaigns, through to viral stunts and actually doing the covers themselves. Ad agencies are able to crystallise the fundamental purpose of the brand, and most importantly, what response they want the audience to have. The Guardian ad has generated a lot of comment, most entertainingly at Hawkblocker.com, but before we get to that, here’s a few other media ads that have really worked. This is the 10 second version of the launch TV ad for IPC’s Look magazine, made by Grey London. Fundamental to establishing Look as the UK’s biggest selling fashion magazine, the message is crystal clear. Look is all about High Street fashion. Buy clothes, buy the magazine. 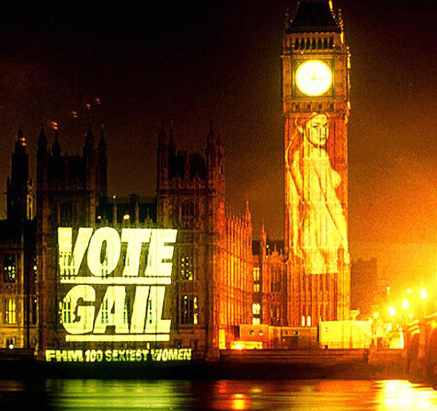 The outrageous projection of Gail Porter’s arse onto the houses of parliament was judged by the BBC to be the stunt of the century. FHM is now pretty much a busted flush, but at the time, the scale and bravado of the campaign really did help establish the brand. And importantly, it asked you to take action, in this case, Vote Gail! The projection was organised by Cunning Stunts, but the accompanying print ad here was done by none other than BBH. You’ll find it in John Hegarty’s excellent new book! The most direct route for an ad agency to take, is to design the cover itself. It rarely happens of course, but this is the most famous example. 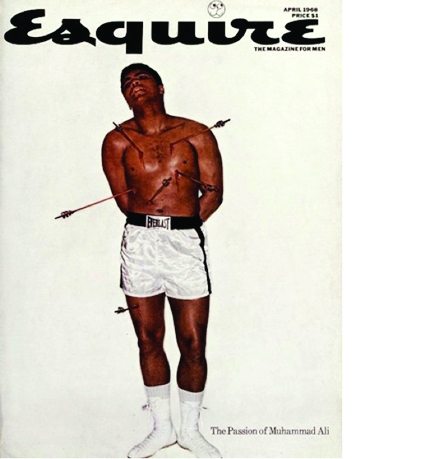 The story of how George Lois designed the cover of US Esquire all through the 60’s is well known, but the action required is clear: read the story, look at Ali differently. Sometimes publishers just do it themselves. 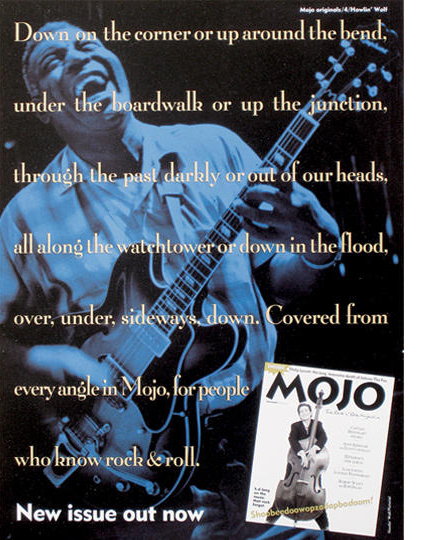 This was the launch press ad campaign for Mojo back in the day. 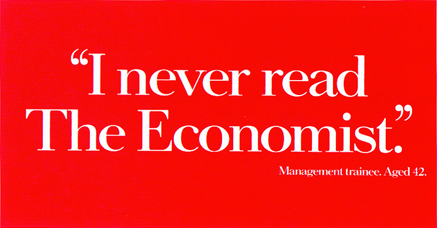 Written by David Hepworth and designed by me, the campaign didn’t run for long, so it’s hard to know if it had any lasting effect, but at least it can be claimed to have given the brand a good start. As for the Guardian, they’re arguably having their best years ever in terms of journalistic success. They’ve bloodied Murdoch’s nose, collaborated with the New York Times over wikileaks, and last week won yet more awards for their website and use of social media. But they lost £33m last year, £171m the year before, and £96m the year before that. At this rate, the trust that owns the Guardian could run out of money in three to five years. The big bet seems to be all about making the Guardian a truly global force, and monetising the hell out of that. But as Colin Morrison has identified at Flashes and Flames, the four international newspaper businesses that are expanding and growing profits do not include the Guardian. The Guardian‘s new ad looks as if it has been made with America in mind, so it should do well in raising awareness there. But after that, what else will it ask of the audience? To participate more? Think even better of the Guardian than they already do? Or just admire the genius of the ad agency behind the work. Back in 1986, things were very much simpler. This is the Guardian‘s only previous TV commercial, ‘Skinhead’, made by BMP. The Guardian was attempting to fend off the launch of The Independent, so this ad was created to show that the Guardian was different. That if you wanted a paper without prejudice, the Guardian was the one to buy. But today, you don’t need to buy the Guardian at all, because it’s free online. So one way or another, I think BBH and the Guardian are going to have to work out how to get me to pay more for the brand. ‘Cos I’m willing to do just that.